Kiteboarding in the Turks and Caicos. Although still a viable location, Grand Turk doesn’t quite compare to what the Caicos Islands offer. Due to the consistent east southeast trade winds, the beautiful west coast beaches are not a safe option due to offshore wind. 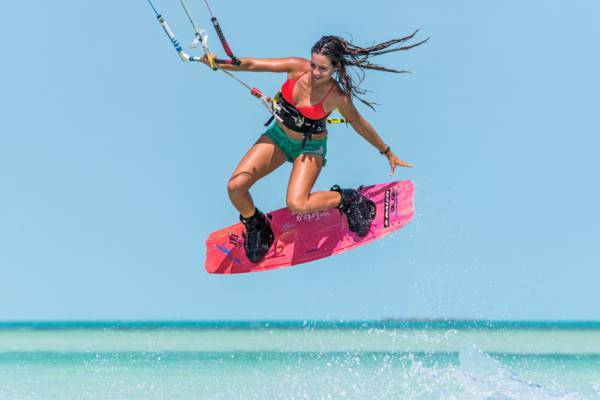 Professional kiteboarder Hope LeVin on the Turks and Caicos waters. Grand Turk is home to the Turks and Caicos capital city of Cockburn Town. This small and low-elevation island features beaches on much of its coasts, yet there is great variance in quality. The west coast sites, which include the Cruise Center Beach, Governor's Beach, Cockburn Town Beach and Pillory Beach are spectacular as beaches, however they are not typically suitable for kiteboarding due to the typical eastern trade winds, which blow offshore. Consequently, the not quite as spectacular looking east coast beaches are better suited for the water sport. One bright aspect of these areas is the lack of crowds, which can be stifling near the Cruise Center. 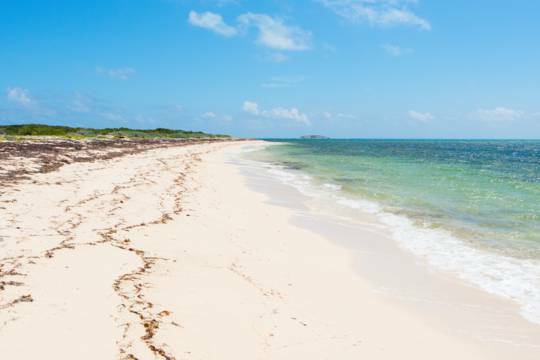 It’s difficult for anything to be considered “remote” on the island of Grand Turk, yet East Side Beach and White Sands Beach are the closest approximation, and support comparatively low levels of surrounding development. Generally, the conditions at the windward islands of Grand Turk, Salt Cay and South Caicos tend to match the weather forecast a little better than the central Caicos Islands. Abnormal conditions caused by storms and squalls may change effect wind directions. In such cases, the beautiful west coast beaches and surf spots may become the better kite location. Several beautiful and uninhabited cays are found to the south of Grand Turk, and these islands can be a great place to explore. There are no organized kite safaris or tours on Grand Turk, yet private boat charters can easily be arranged. If you do so, keep in mind that your captain will likely have no experience with kiteboarding, so you’ll have to give instructions on what you expect and how you’d like the vessel to follow if you do a downwind kite. Gibbs Cay and East Cay offer incredible beaches to launch from, yet the small elevation at Gibbs Cay can causes some gusty conditions. A great route is from East Cay to the western side of North Bay on Salt Cay, which is an 8 mile (13km) route. During the winter season, it’s likely that you’ll be sharing the ocean with humpback whales in this area! For kiters visiting on a cruise ship, a little research and planning is necessary to get the most out of your visit. First and foremost is to check the wind forecast to see if it’s worth the attempt. It makes sense to rent a car for your visit. You’ll be able to check out viable kite spots, and if the wind isn’t blowing, you’ll be ready to explore the attractions and beaches of Grand Turk; our top recommended activity for visitors to the island. White Sands Beach is within walking distance of the Grand Turk Cruise Center. If you take the direct route across Hawkes Nest Salina (interesting sights of the past sea salt industry along the way), the distance is about 1.2 miles (2km) one way. The distance along the beach (south from the Cruise Center past Boaby Rock Point) is similar. Be sure to take plenty of drinking water. At most locations, beach conditions are wide and clean enough to solo launch a kite. Unfortunately, there isn’t sufficient time during the typical cruise ship stop to visit the spectacular kite spots in the Caicos Islands. Unfortunately, there’s very little technical support for kiteboarding on Grand Turk, with no organized schools and instructors. The home of kiteboarding in the country, all kite schools and equipment rentals are based on Providenciales, where it’s possible to rent kites, boards, lines, harnesses and anything else you’d need. If you’re looking to pick up the sport, you should seriously consider staying on Providenciales and learning at the unparalleled kite spot of Long Bay Beach (part of the incredibly-turquoise Caicos Banks). See Providenciales Kiteboarding for more information. If you’re set on learning to kiteboard on Grand Turk, it’s often possible to arrange for one of the instructors from Providenciales to stop over for the day, at added expense of course. Grand Turk only has a few viable and safe kite spots due to the entire west coast usually experiencing offshore wind. Below are the main viable locations. 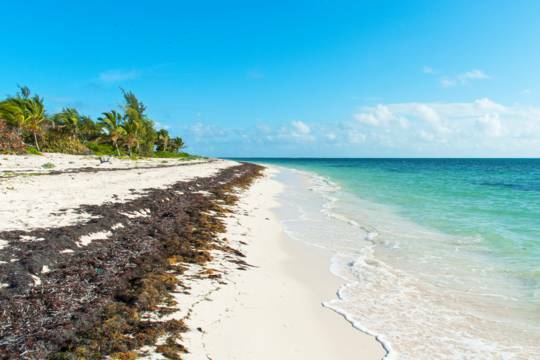 Although not a very appealing beach due to large amounts of seaweed in the water, White Sands Beach on the southeast point of the island is one of the better kiteboarding spots. Wind is typically onshore, and water surface conditions aren’t as choppy as at East Side Beach. This four mile long stretch of beach on the east side of Grand Turk typically has onshore wind, but can get quite choppy at times. The ocean water here varies quite a bit. In some area, there’s a clean sandy bottom. Other spots have large amounts of seaweed.